Now the name of a short, crescent-shaped thoroughfare which links the Strand with Kingsway in the West End (and the area surrounding it), the name actually refers back to the Saxon era. 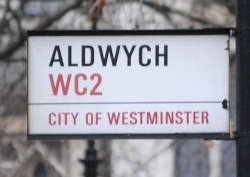 The name Aldwych, which translates roughly as “old trading place” or “old settlement”, referred to a seventh century Anglo-Saxon settlement which was built outside the walls of the Roman city of Londinium. It was after Alfred the Great had the walls of the Roman city refortified in the late 9th century – moving the settlement back inside, that the former Anglo-Saxon settlement eventually became known by the moniker ‘old’. The modern use of the word for the area dates from just after the dawn of the 20th century when the new street was created, doing away with a number of former streets including the notorious Wych Street. The name was subsequently used for a station on the tramway which ran under Kingsway (closed in the 1950s) and for an Underground station located nearby on the Strand (originally named Strand Station, it was soon changed to Aldwych and closed in 1994). Notable buildings along Aldwych today include both Australia House and India House, both home to the High Commissions of their nations and both of which date from the early 20th century. It’s also home to Bush House, formerly the headquarters of the BBC World Service and now part of King’s College, London, as well as a number of theatres – including the Aldwych Theatre – and hotels. Certainly sounds like an interesting place. Why notorious Wych Street?